I made this salad last month for a final end of summer hoorah BBQ and let me just tell you, it was delish! The olive oil mixed with vinegar and lime juice creates a zesty vinaigrette dressing and just pairs so nicely with the sweetness of the corn and the saltiness of the quest fresco and then don’t forget the smoky flavor from the paprika. It hits all those flavor points your mouth desires. This recipe goes great with grilled meats or any Mexican dish. Tacos, enchiladas, you name it. It is cheap, easy, and so quick to make. Like really quick. This recipe literally took me 5 minutes from start to finish. Note: You can make this with fresh corn on the cob or canned. It is great both ways. If you are using fresh corn you will need about 6-8 cobs of corn. Cook them as you normally would, whether that be on the grill or in a pot of water. Then allow the cobs to cool completely and cut the kernels off the cob and prepare the salad as directed. Place the corn kernels, tomatoes, and green onions into a serving bowl. In a small bowl, whisk together the vinegar, olive oil, and lime juice. Pour the dressing over the corn and stir to coat. Top with the queso fresco and a sprinkling of paprika. I first tried this recipe about two months ago and have since made it at least 6 times tweaking it a little bit each time. IT HAS BECOME ONE OF MY ALL TIME FAVES! We are actually having it again this week. It is perfect for this summer fully utilizing all those fresh tomatoes and basil. Most of my recipes are for a main dish or a side dish but this one is actually an entire meal. All of the components of this dish are just amazing! You have a flavorful juicy roasted chicken breast, sweet caramelized tomatoes that are literally bursting with flavor, and then the salty creamy fresh mozzarella with a nice little kick of heat from crushed red peppers, and then of course to balance it out you have some hearty brown rice simmered in chicken broth. Is your mouth watering now? Mine is! All these flavors are just so amazing together! Depending on the brown rice you get, this dinner takes about 45 minutes from start to finish and it is worth every minute of it! Note: You can use fresh mozzarella in any form. I have used both the sliced mozzarella log as well as the little mozzarella balls. This makes a dinner that will serve 3–4 people. Cook the brown rice per the package instructions but substitute chicken broth for water. While the rice is cooking preheat the oven to 400º. Place the cherry tomatoes on a baking sheet and drizzle with olive oil and balsamic vinegar. Toss to coat. Bake the tomatoes and chicken for about 25 minutes or until the tomatoes have just started to burst and the chicken is done. While the rice, chicken, and tomatoes are cooking prepare the mozzarella. Place the mozzarella in a small bowl and drizzle with olive oil and sprinkle with red pepper flakes and salt. Once all the components of the dish are ready, plate the rice, chicken, blistered tomatoes, mozzarella, and top with chopped basil. Summer is coming… but the warm weather is already here! Time to fire up the grill! Okay, onto the dish. Each of these components is delicious on it’s own but when brought together you get some amazing tacos! You have the grilled chili lime chicken which is so tender and has so much flavor, a little zest from the lime paired up with all those delicious seasonings and a tad of heat. Then you have this delicious chunky salsa made up of a sweet caramelized pineapple with a nice smoky flavor from the grilled red pepper and jalapeño. And is if that isn’t enough, (yes, it gets better!) then you add this refreshing avocado crema. Just give me a bag of tortilla chips and I will go to town on that sauce! Another thing I love about this recipe is how pretty it is! Look at all those amazing colors! I truly love everything about this recipe! I hope you will too. Note: If you want to cut down on the amount of preparation at dinner time, you can marinade the chicken for as long as 24 hours in advance and the crema can be made up to four hours in advance. Having a chunk of the leg work done in advance makes this a perfect recipe to make for dinner guests. All you have to do is grill the chicken, pineapple, and peppers, and warm up some tortillas. Place the chicken breasts in a large Pyrex dish. Whisk together all the additional chili lime chicken ingredients in a small bowl and slather all over both sides of the chicken breasts. Cover the Pyrex with plastic wrap and set aside to marinade for 30 minutes. While the chicken is marinating, begin preparing items for the salsa. Skewer the red onions and then drizzle them, the bell pepper, and jalapeño with olive oil and set aside with the pineapple. Preheat your grill to 375–425º. Grill the chicken for 8–10 minutes on one side and then flip. Add the pineapple and peppers to the grill and cook for 4­–5 minutes before flipping and then continue to grill them for another 4–5 minutes. Continue to cook the chicken until a thermometer reads 160º when inserted into the thickest part of the meat, the pineapple until it is nicely caramelized, and the veggies until they have some nice grill marks. Transfer everything from the grill to a cutting board and allow it to rest for 5 minutes. While all the grilled items are resting get started on the avocado cream. Add all the crema ingredients to a blender and puree until smooth and well blended, set aside. Chop up the pineapple, onion, and peppers and place them in a bowl. Add the cilantro, lime juice, ginger, cumin, salt, and pepper to the bowl and stir. Chop up the chicken and set aside. Everything is finally ready! Time to assemble the tacos! Heat up your tortillas and top each one with meat, cheese, pineapple salsa, and avocado crema. Recipe adapted from Carlsbad Cravings. I might as well take on the title as Queen of Appetizers. It’s just what I do. I personally just love appetizers and finger foods and no party is complete without a nice spread. When it comes to throwing a party a good dip is a must on the appetizer menu. There is no need to spend hours slaving away in the kitchen to come up with something everyone will love. This recipe literally takes five minutes to make and is so easy! You spend more time measuring out the seasonings than anything else. Just toss it all in the blender and voila! 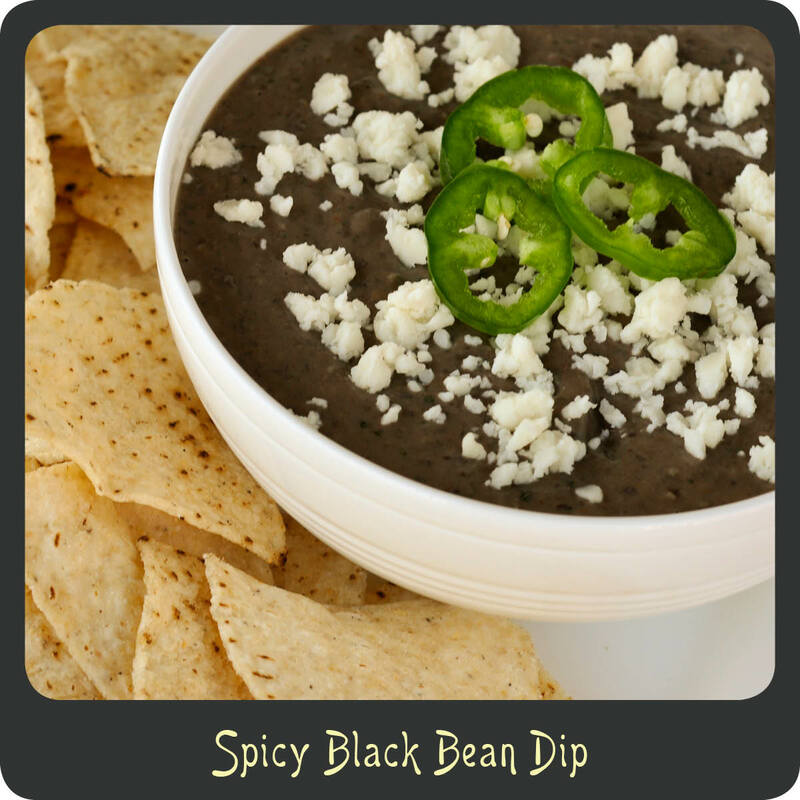 You have a delicious bean dip ready to serve! The flavors in this dip are amazing. It might look sort of blah but then you take one bite and zap, bing, bang! Flavor explosions happening right in your mouth! You have a nice kick from the jalapeños, a little zest from the lime and lots of other great flavors from all the seasonings. The first time I made this I was (no joke) licking it off the rubber spatula. This is great at room temperature, warm, or even right out of the fridge. Talk about diverse! Next time you are throwing or attending a party make this recipe. You will have lots of people asking for the recipe. No need to tell them it took less than five minutes to make. That can be our little secret. Place all of the main ingredients except the water into the blender or food processor and blend until well mixed. Add 4 tablespoons of water and continue blending until nice and smooth. If necessary, continue adding water 2 tablespoons at a time until it reaches the desired consistency. Transfer to a bowl and garnish with some crumbled cotija cheese and slices of fresh jalapeños. Enjoy with some tortilla chips now or place in fridge until ready to serve. When most people think of salads they think of a big pile of greens topped with a handful of other veggies and dressing. Well this is not your ordinary salad. 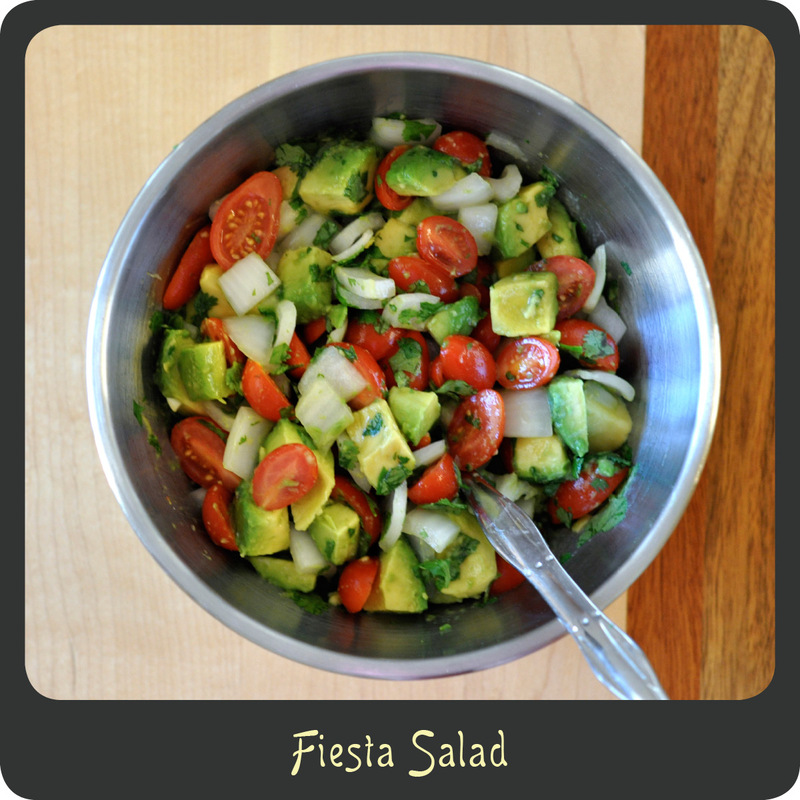 It consists of avocados, tomato, cilantro, and a sweet onion all tossed in a lime olive oil dressing. No lettuce here! I always make this with my Rio Grande Spice Rub New York Steaks and Cornbread Muffins. Seriously amazing! I also love this recipe with a nice piece of grilled fish. This simple salad is made up of fresh summer ingredients and is so light, and refreshing. Perfect for those nights you want a quick and easy side dish but just don’t want to fire up the oven. Note: Since avocados can become mushy and brown quickly, wait to add the avocadoes until right before serving. 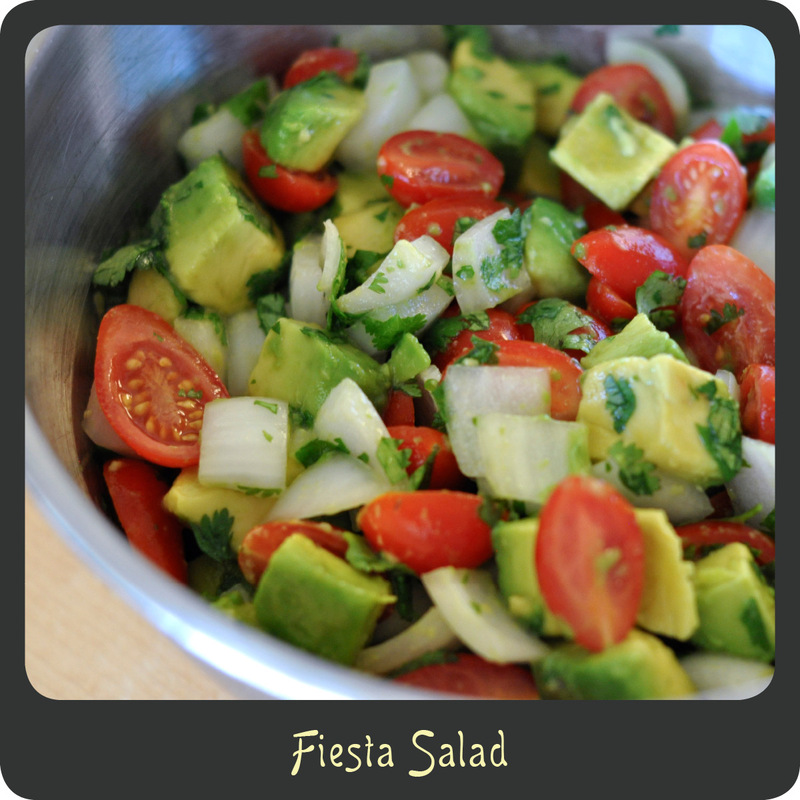 In a medium bowl combine the tomatoes, onion, cilantro, salt, olive oil, and lime juice. Toss to combine. Add the avocado last and gently stir it in. It’s the dreaded time of year where I make an effort to eat healthier with the hopes I can fit into the same shorts I was wearing last year. Don’t get me wrong, I love spring and summer, it is just such a disappointment when you go to put on your super cute shorts and they just don’t quite fit like they did the last summer. Blah. This year I am determined to get better at cooking healthier meals that I, as well as my family, want to eat. I find that I frequently get into salad ruts. I am trying to get it out of my head that you can eat more than salads and still eat healthy and satisfying meals. So one thing I have been doing is substituting lean ground turkey and chicken for beef in more recipes. I made this Cincinnati chili with ground turkey and it turned out amazing. My husband and son didn’t even know it wasn’t beef. Point for mom! Note: I am not from Cincinnati, nor have I ever had authentic Cincinnati chili. 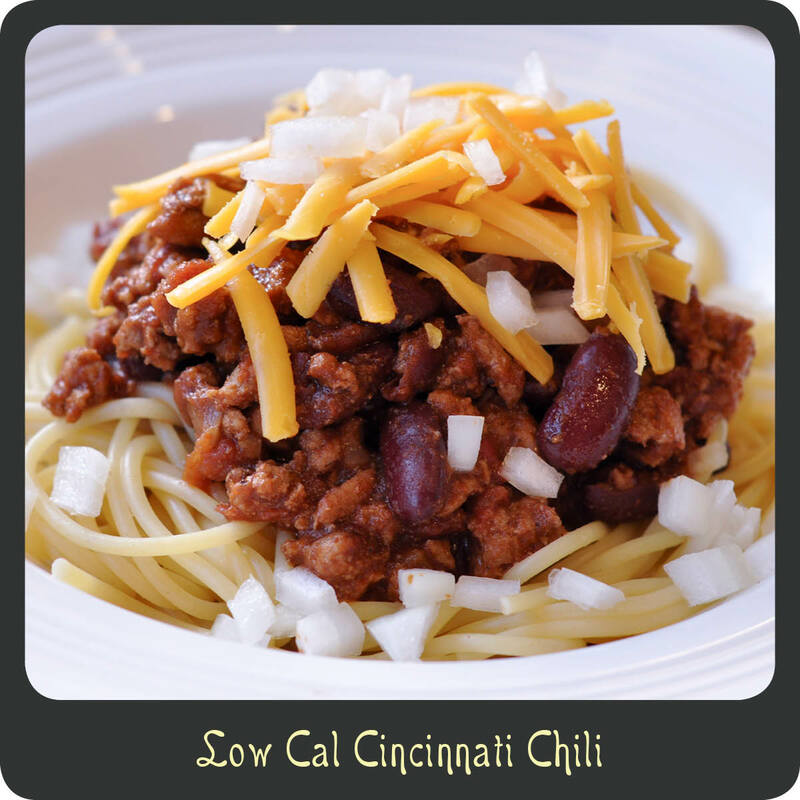 I know there are individuals who are very particular about their Cincinnati chili and how it is prepared. I am not claiming this as “authentic” Cincinnati chili, I am just claiming this to be a damn good recipe. In a large pot heat olive oil over medium-high heat. Place the ground turkey in the pot and cook for about 8–10 minutes making sure to break up the chunks with a spatula. Once the onion has had a chance to cook add in the tomatoes, beans, Worcestershire sauce, red wine vinegar, chili powder, unsweetened cocoa powder, cinnamon, nutmeg, cumin, black pepper, cayenne pepper, and water. Bring the liquid to a boil and then reduce heat to a simmer. Partially cover the pot and simmer for 45 minutes making sure to stir occasionally. Serve the sauce over cooked noodles and garnish with shredded cheddar and some chopped onions. Well as a house-warming gift my incredible dad and stepmom gave us an ice chest full of all sorts of wonderful cuts of lamb and even some pork! That is probably the best and most practical housewarming gift you could give a person right? Okay, maybe the best housewarming gift you could give a foodie. Daddy knows me all too well. Thankfully there was lots of ground lamb in the mix so I have been able to make this awesome dish a couple of times recently. Turn the oven on to broil. Form the meat into 1 1/4″ balls and place them in a baking dish. Place the dish in the oven on the middle rack and cook for 8–10 minutes. While the lamb meatballs are cooking, prepare the couscous per package instructions. In a small bowl whisk together the olive oil, lemon juice, and some salt and pepper. Once the meatballs are couscous are done it’s time to plate. 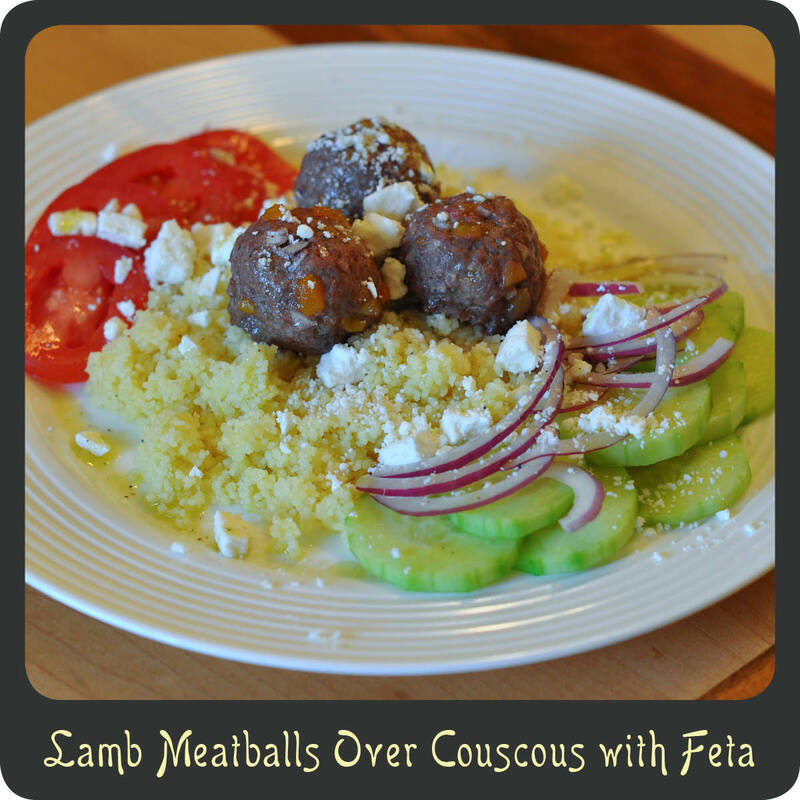 Place a nice size scoop of the couscous in the center of the plate and top with 3–5 meatballs. Place the sliced tomatoes, cucumber, and red onion on the plate next to the couscous. Drizzle the lemon olive oil dressing over everything on the plate and then finish off with the crumbled feta cheese. Dinner is ready to serve! Recipe adapted from Real Simple.